Poster for 2011 MidSummer's Dream - Ashland's Premiere Art & Music Festival. Artwork for this years poster by artist and friend Inger Jorgensen. “The Stone Bead” is once again exhibiting at Ashland Oregon’s Premiere Art & Music Festival. After taking a break from this festival for a year, I am excited to be back at the park-like grounds of the Briscoe ArtWing for the seventh annual MidSummer’s Dream Art & Music Festival. The event takes place June 11 & 12. This is also the same weekend as Southern Oregon University’s graduation commencement. The town of Ashland is bustling with the energy of graduates and festival goers. If you have never been to MidSummer’s Dream, you owe it to yourself to check out this event. This is the best Art & Music Festival in Ashland, and its free to the festival goer. There will be about 75 to 80 regional artist and artisan booths, as well as two stages highlighting some of the best musicians southern Oregon has to offer. For more information on the event, follow the blog at midsummersdreamfestival.com — information about the event is being added every few days. You should also go to the Facebook page and become a fan of the festival. Did I mention that the event is free. Free!!! I have been super busy making hand sculpted stone beads. I’ve been designing jewelry for 20 years and feel like my pieces are better than ever. I am extremely happy with my latest series of boulder opal pendants. However, my favorite pieces lately are featuring green-stone beads made from material found on the beaches of Northern California. The hand-cut nephrite jade cylinder beads I have been creating are nearly identical to pre-Columbian beads I have in my personal collection, but made in my humble shop in Talent, Oregon — very cool!!! 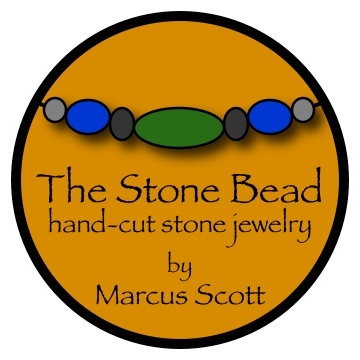 I always envisioned being able to replicate the look and feel of ancient stone beads. It is interesting living in a world going full tilt, and working to recreate something ancient cultures perfected over 2000 years ago. The theme for this years event is “Creating Paradigm Shift”. Maybe part of that shift is the understanding that the past, the present, and the future are all intricately connected. Maybe part of that shift comes from a new appreciation of the simplest of things, and the humblest designs. It seems to me that civilization is spinning out of control. Maybe taking time to just count beads on a strand would do the average human a lot of good. Maybe part of the shift is to slow down. This entry was posted in Festivals and tagged festivals, handmade, live music, MidSummer's Dream, paradigm shift, stone beads. Bookmark the permalink. I purchased a necklace of yours in Ashland. I would love to have more… right now, I would like to purchase a bracelet. I live in California and would like to be able to order on line. If you have photos, you could send, I would love that. Hi Cathleen, I won’t have an online store until early next year. What kind of stones are you looking for? And what style of necklace do you have? I will be in Eureka, California the first weekend in December at Redwood acres. Here in Ashland a lot throughout the Holiday Season. Check in here … soon I will have my Holiday Schedule up.